This weekend, the paragliding festival "Highlands under the paragliding" will be coordinated by Vietwings Hanoi with Lao Cai People's Committee held on 02-03 / 06/2018 at Mount Ba Me Con - Na Co Lake (Bac Ha District). Do you know about the mysterious Tien Cave in Sapa? This is an activity within the framework of the Bac Ha Tourism Week in 2018 at the provincial level from 01 to 09/06/2018 with the theme "Colors of Highland White". The take-off point is located near the highest peak of the Three Mother Mountain while three landing sites are located within the Na Co lake and Bac Ha Stadium. 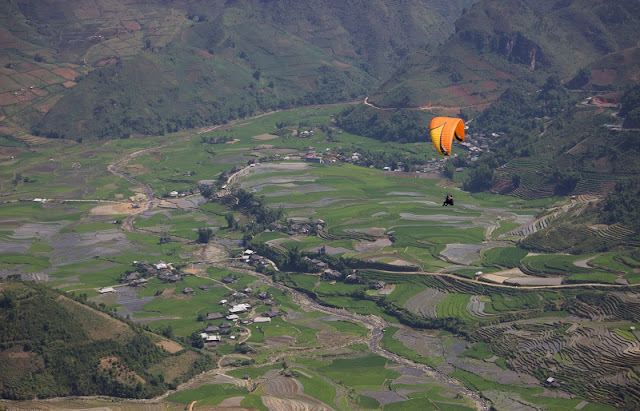 At the event, you can admire the beauty of the Bac Ha Plateau with the paragliding, the technical performances of the pilot. Surely this will be an attractive option for everyone's weekend trip with Sapa exploring tours. Sa Pa - "Paradise summer resort"
Why the best time to visit Vietnam is right now? Times back to Sapa next, what you will do?